In 2014, the Ely DA AGM and 8-bell striking competition was held in the Ely District on Saturday 3rd May . The striking competition took place at Longstanton. The photo shows the Ely District band, mostly wearing their 'Winners' shirts from 2012, which were also relevant in 2013. This year the Ely District was placed 2nd (79%), with the Huntingdon District first (82%) and the Cambridge District 3rd (50%). More photos on the Ely DAwebsite. There was general ringing at Millcroft Campanile, and then general and service ringing at Over. After a short service in Over church, we enjoyed tea in the church hall, followed by the AGM. All the Association Officers were re-elected. 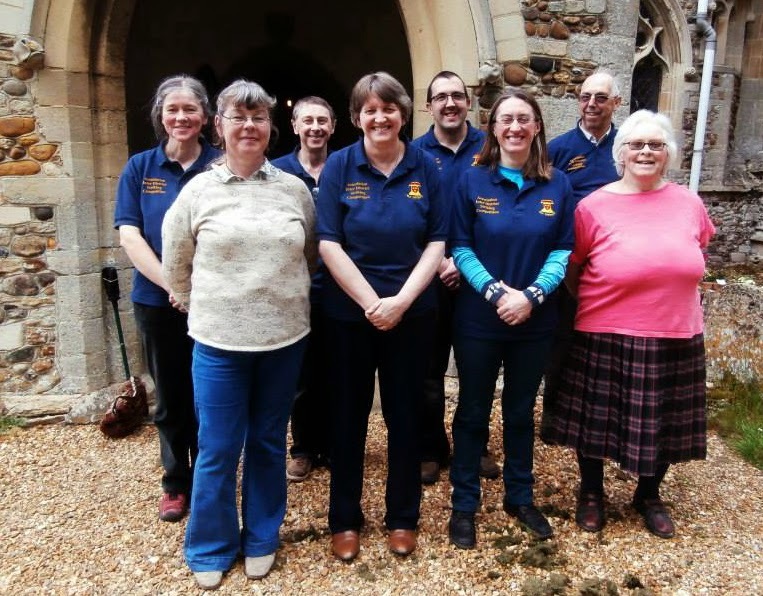 Catherina Griffiths had hoped to stand down as General Secretary, but has agreed to continue for the present while a new secretary is recruited, with the intention that the new secretary will 'shadow' Catherina during the year and gradually take over from her. If you are interested in taking on this important role for the Association, please contact Tom Ridgman (chairman_at_elyda.org.uk) or Catherina (secretary_at_elyda.org.uk) to discuss what is involved.